WebTitan’s simplicity distinguishes it from the Competitors! By deploying WebTitan, the company is saving thousands of dollars and reclaiming all the IT time formerly spent managing their previous appliance. 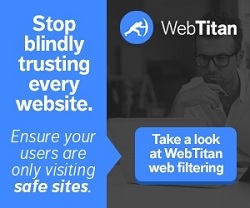 Since implementing WebTitan GVS have been able to increase productivity and are now able to make sure protections are in place so the company can benefit from the safe use of Web 2.0. Websense replaced by WebTitan’s cost effective solution! The company saved 50% in licencing cost and achieved greater flexibility than with Websense. They are also enjoying the same flexibility, scalability and stability that they experienced with SpamTitan.